Discussion in 'Third Trimester' started by Rooander, Jul 6, 2005. Thought I would start a December baby tummy page. Then we can all compare how big we are all getting and due around the same time. This is me at 17wks, although Im sure its gots bigger since. wow your bump is so nice and neat. Lucky you. Have you any idea what you think it might be? Thanx! It may look neat but it feels very stretched and uncomfortable! My mum kindly reminded me this morning that it only gets worse. Nice of her! LOL, yes I know what you mean. My first was a right little kicker inside. Used to see his foot or elbow kicking the side of my tummy. This one though seems a little reluctent (cant spell today) to be that active. I cant remember when i first felt my boy kicking it was so long ago (8yrs ago) but this one i felt it moving yesterday for the first time, which people have been saying is quite late for a 2nd baby. But Im just putting it down to the fact that it was so many years ago and my body thinks its a first!!!!! Well I can hope anyway!!! Well here's mine. I'm feeling uncomfortable today. 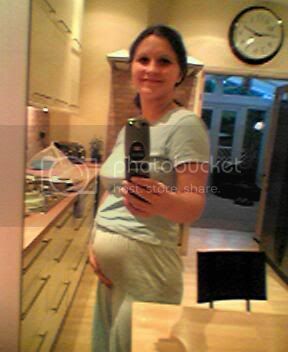 Rosieroo, thats a lovely bump and for 15 wks. Mine seems to have grown again this past week. 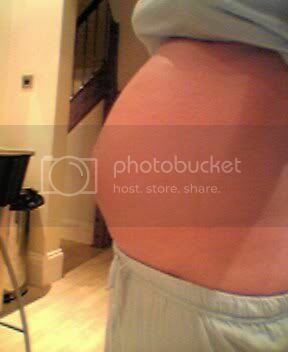 Really cant wait for it start showing so that people think your pregnant and not fat!!! Just remember what they say girls...its whats on the inside that counts! im just as big as a person well into her 7th month and im only into my 5th ill be 6 months on the 24th much luck to all and there little bumps! And its still getting bigger everyday. Heres my 27 wk bump. People keep saying that I seem big for my dates. Does anyone else get told that???? Maybe your bump seems bigger because you are still nice and slim all over? Hey December girlies, hows everyones bumps coming along? I feel a bit lonely in here as it doesnt seem like theres many december mums, come on girls show off your tums!!! This is me at 30 wks. This is my 32 wks pic. Where are all the December mums to be???? Surely theres more than 2 of us.